Where is the Capital of Michigan? 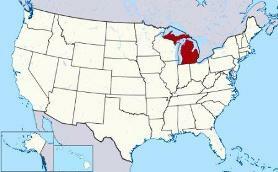 The Map of Michigan (MI) shows the location of the state capital in the "Great Lakes State". Michigan has 83 counties, and the capital of the State is Lansing. On a map, the capital city is always indicated by a star. Interesting fun facts about Lansing including its history, location, county, current population, size of the city and the nickname of Lansing, Michigan. The Map of Michigan and map provides an outline of the state, which covers 96,810 square miles. The size of the state's capital city, Lansing, is 36.68 square miles. Test your recognition skills of the map of the state, and knowledge of its capital, with our State Maps Quiz Game. The location of Lansing is in the south central part of the Lower Peninsula of Michigan at the meeting of the Grand River and the Red Cedar River. 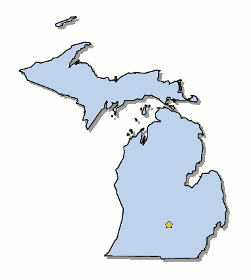 The city is located in Ingham County, although small parts of the city extend into Eaton County, Michigan. Each of the 50 states have their own capital city. The city of Lansing is the capital of the state. The capital does not have to be the largest city in the state, but is usually centrally located either geographically or by population. History & Facts on Lansing, the Capital of Michigan? Fact 3: The population of the capital city is 113,996. Nickname "City With a Future"
Fact 5: History - In 1835 two brothers from New York plotted the area now known as REO Town just south of Lansing and named it "Biddle City." Fact 7: History - The state capital was originally Detroit but in 1847 the constitution was changed changing the capital to Lansing which was located in a safer area, away from British threats, in the interior of the state. Fact 8: History - In April 1848, the legislature then gave the settlement the name of "Lansing." The number of people, or the population of the capital city of Lansing, obviously changes constantly but the government statistics for the 2012 population of Lansing was 113,996, which provides a good indication of the number of inhabitants of the city. We hope that the interesting facts and information about Lansing will help kids and school children with their homework. Learn more by playing the States and Capitals Game. Lansing Nickname "City With a Future"